Activated AluminaActivated Alumina is an aluminum oxide that is highly porous and exhibits tremendous surface area. It is resistant to thermal shock and abrasion and will not shrink, swell, soften nor disintegrate when immersed in water. Grade DD-6Granular scavenger for the removal of process impurities from aqueous or hydrocarbon streams. Particularly useful for the removal of low level polar and/or ionic species. High macroporosity improves diffusion rates while high surface area provides enhanced capacity. Grade F-200Grade F-200 is recommended for drying gases and liquids: for maintenance of transformer and lubricating oils; for drying refrigerants; and for applications where extremely low dew points are desirable. Activated CharcoalActivated Charcoal (or Carbon) is a versatile and high capacity adsorbent of hydrocarbons, organics and odors. It is used for the removal of hydrocarbons from liquid and gas streams and the removal of odors. Getter®Getter® is a prepackaged sachet-style packet of Activated Charcoal designed to adsorb corrosive and odor-causing gases in small spaces. Getter® is commonly used to adsorb odor vapors emanating from molded plastic containers. It is also used to adsorb hydrocarbons that can become acidic in a damp environment. It helps protect metal objects from tarnishing caused by the presence of corrosive gasses. Grade ACActivated Charcoal is commonly used throughout the health physics industry as an air sampling trap. Contaminates adsorbed on the Activated Charcoal can be quantitatively determined and them compared to NIOSH Standards. Activated Charcoal is used to adsorb trace quantities of contaminates, such as pesticide, from solvents. It is the ideal oil mist removal agent for compressed air. It is also the preferred adsorbent for the trapping of hydrocarbons in inert gas streams. Grade GL-60GL-60 is mainly used for the purification of potable water, industrial waste water treatment and ground water remediation. Grade GL-60 meets the A.W.W.A. standard B-600-74 for treatment of potable water and is completely compatible with all municipal water treatment use. Coal based Activated Charcoal. Bagged DesiccantsADCOA carries a full line of pre-packaged bagged desiccants in a range of bag sizes. In general, the volume of the container you wish to dry will determine the size of the Desi Pak bag required. Desi-Pak® Type I & IIDesi-Pak® is a dimensionally stable, chemically inert, aluminum silcate clay packaged in non-dusting, air permeable bags. The internal structure of this clay is a network of microscopic pores that attract and hold water through physical adsorption. Desi-Pak® remains dry and will not soften or liquefy even at full water saturation. It is non-corrosive and can be placed in direct contact with metal parts. Desi-Pak® GDT II Drop-insDesi-Pak® GDT II Drop-ins are prepackaged sachet-style packets of dimensionally stable, chemically inert, aluminum silicate clay. The internal structure of this clay is a network of microscopic pores that attract and hold water through physical adsorption. Desi-Pak® remains dry and will not soften or liquefy even at full water saturation. It is non-corrosive and can be placed in direct contact with metal parts. The Activated Clay used in our Desi-Pak Drop-in Packets® actually adsorbs MORE water vapor than Silica Gel at low Relative Humidity. Desi-Pak® Activated Clay is non-synthetic, naturally-occuring material. 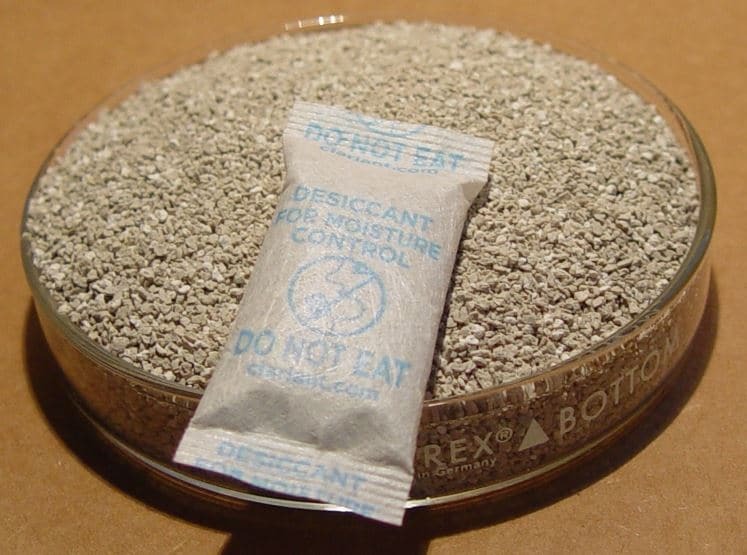 It is the same Activated Clay desiccant used in our MIL-D-3463 compliant desiccant bags. Sorb-It®Sorb-It® is a prepackaged sachet-style packet of Silica Gel commonly used in the packaging of electronic components, pharmaceuticals, dried foods and machine parts. Perfect for the hobbyist or collector of stamps, magazines, comic books, autographs and other cellulose items. Prevents corrosion and contamination. Prepackaged sodium form of Zeolite. Commonly used in the packaging of electronic components, pharmaceuticals, dried foods and machine parts. Perfect for the hobbyist or collector of stamps, magazines, comic books, autographs and other cellulose items. Prevents corrosion and contamination. Tri-Sorb®Tri-Sorb® is a prepackaged sachet-style packets of Type 4A Molecular Sieve specifically designed to adsorb water vapor in static environments where tempertures may exceed 100°F and absolute water vapor adsorption is a must. It can achieve extremely low dewpoints in properly sealed packaging in instrumentation. Type 4A Molecular Sieve will adsorb molecules with a critcal diameter of less than four Angstroms. i.e. : Carbon Dioxide. Prepackaged sodium form of Zeolite. Circuit Breaker DesiccantsADCOA has had long experience in working with the major utilities and power circuit breaker manufacturers in the development and production of SF6 Circuit Breaker Desiccant Bags. These bags are designed to be suspended in the breaker housings to adsorb water vapor and other arc products. Molecular SievesMolecular Sieves are synthetically produced Zeolites characterized by pores and crystalline cavities of extremely uniform dimensions. Other adsorbents of commercial importance are typically described as having “pore size ranges”. The pore sizes of these adsorbents can vary widely on the face of the same particle. Molecular Sieves will not have this variation in pore size. Type 13XThe preferred Molecular Sieve adsorbent for dynamic dehydration in a closed gas or liquid system. Used commercially for general gas drying, air plan feed purification (simultaneous removal of H2O and CO2) and liquid hydrocarbon and natural gas sweetening (H2S and mercaptan removal). A modified sodium form of Zeolite. Type 3AType 3A will adsorb those molecules having a critical pore diameter of less than three angstroms. e.g. : Helium Hydrogen and Carbon Monoxide. It it also the preferred Molecular Sieve adsorbent for the commercial dehydration of unsaturated hydrocarbon streams such as cracked gas, propylene, butadiene and acetylene. The potassium form of Zeolite. Type 3A Molecular Sieve is recommended for drying unsaturated hydrocarbons and highly polar compounds such as methanol and ethanol. The 3A structure is particularly effective in dehydrating the inner space of insulating glass windows as well as refrigerant gases. Type 4AType 4A Molecular Sieve is the preferred adsorbent for static dehydration in a closed gas or liquid system. It is used as a static desiccant in household refrigerating systems, packaging of drugs, electronic components, perishable chemicals and as a water scavenger in paint and plastic systems. Also used commercially in drying saturated hydrocarbon streams. The sodium form of Zeolite. Type 4A Molecular Sieve is typically used in regenerable drying systems to remove water vapor or contaminants that have a smaller critical diameter than four angstroms. Type 4A-Moisture IndicatingMoisture-indicating Molecular Sieves are beads that have been chemically impregnated to display a blue color when fully activated by removing the water of hydration. When a gas stream is dried using this product, the blue color will turn to pink as water is adsorbed denoting saturation of the sieve. The sieve may then be reactivated at 200°C under vacuum or nitrogen atmosphere for several hours. More conveniently, the sieve may be replaced from fresh stock. Type 4A Moisture-Indicating Molecular Sieve is the preferred adsorbent for static dehydration in a closed gas or liquid system. It is used as a static desiccant in household refrigeration systems, packaging of drugs, electronic components, perishable chemicals and as a water scavenger in paint and plastic systems. Also used commercially in drying saturated hydrocarbon streams. Type 5AType 5A Molecular Sieve is typically used to separate normal paraffins from branched-chain and cyclic hydrocarbons through a selective adsorption process. Type 5-A will adsorb those molecules having a critical pore diameter of less than five angstroms. e.g. : Methanol, Ethane and Propane. The calcium form of Zeolite. Humidity Indicator CardsHumidity Indicator Cards are simple “hygrometers” that rely upon the reaction of a chemical agent impregnated on each card with water in the surrounding atmosphere to show within a narrow range of accuracy the prevailing Relative Humidity. Humidity Indicator Cards can be used in conjunction with a Desiccant in order to assure that the Relative Humidity within a package, compartment, electrical panel, vessel, instrumentation cabinet or sealed container never approaches levels that would cause corrosion. condensation or equipment failure. The “Active” (Blue) condition of the card can be restored many times with the application of fresh desiccant when card spots become “Saturated” (Pink). These cards are accurate within the range of plus or minus 2.5% RH. Silica GelSilica Gel is the most widely known and most versatile of all desiccant products. The Silica Gel offered by ADCOA is of the highest purity (99.7+% Elemental silica). Silica Gel Grade 03Typically used for the adsorption of water vapor in natural gas and other industrial gases; (a) Hydrocarbon recover; (b) bulk dehydration of compressed air. For natural gas and other industrial gases; (a) Hydrocarbon recovery; (b) Bulk dehydration of compressed air. Silica Gel Grade 12Typically used for the adsorption water vapor in gas and liquid dehydration. Silica Gel Grade 50Grade 50 Silica Gel does not utilize Cobalt Chloride as the color change agent. Typically used for the adsorption of water vapor in gases, this product is highly suitable in dehydrators or driers where the visual indication of the desiccant status (active/saturated) is necessary. The beads remain orange while the desiccant is in the active condition and turn to green upon saturation. Moisture-indicating Silica Gel / orange to green Commercial standards – Conforms to European Union requiremnts for Moisture-indicating desiccants. Silica Gel Grade 52Grade 52 Silica Gel does not utilize Cobalt Chloride as the color change agent. Typically used for the adsorption of water vapor in gases, this product is highly suitable in dehydrators or driers where the visual indication of the desiccant status (active/saturated) is necessary. The beads remain orange while the desiccant is in the active condition and turn to green upon saturation. Moisture-indicating Silica Gel / orange to green Commercial standards – Conforms to European Union requiremnts for Moisture-indicating desiccants. Sorb-It®Sorb-It® is a prepackaged sachet-style packet of Silica Gel commonly used in the packaging of electronic components, pharmaceuticals, dried foods and machine parts. Perfect for the hobbyist or collector of stamps, magazines, comic books, autographs and other cellulose items. Prevents corrosion and contamination. Prepackaged sodium form of Zeolite. Sorbead R®Bead form of Alumino-Silicate High density, Thermally stable Sorbead R® is an alumino-silicate. Although we have listed it in our Silica Gel category, it is not truly a Silica Gel, nor is it a Molecular Sieve (another type of alumino-silicate). Sorbead R® is a high-density adsorbent capable of drying gases such as air, Carbon Dioxide, natural gas, Nitrogen and Oxygen to extremely low dewpoints in conditions that render other types of desiccant useless after a relatively short period of time. Rapid regeneration cycles? High pressure application? Wet inlet gas? Sorbead R® was made to perform in difficult environments under difficult conditions and to deliver high quality effluent gas as well as long service life. Super Siloxane Adsorbent Silica GelThe field of Bio Energy is rapidly expanding. Municipalities and private waste handlers are increasingly being called upon to utilize the Methane Gases generated at solid waste landfills and sewage treatment plants rather than directing this gas to “flare.” Many waste processing sites are turning to the use of gas turbines in order to convert this gas to clean energy. Increasingly, the manufacturers of personal care items have included Siloxanes in the chemical formulation of these products. Sludge treatment facilities and newer landfills are now producing Methane gas that carries higher levels of Siloxane as a component. This Siloxane component of the combustion gas leaves microcrystalline Silica deposits on heat exchangers and the combustion surfaces of gas turbines. As a result, the manufacturers of gas turbines and reciprocating engines are now calling for the reduction of the presence of Siloxane in combustion gases in order to warranty their products. Microturbine and catalyst failures have focused industry-wide attention on Siloxanes. Container-Dri II®Container Dri® II is a line of specially designed cargo desiccants aimed at protecting cargo during shipping by aggresively absorbing moisture from the air. In doing so, Container Dri® II reduces dew point temperature (the temperature at which condensation begins to form, causing “container rain”), keeping cargo safe and dry. The Container Dri® II line includes several configurations to best fit different needs and modes of transport. Desi-Pak® GDT II Drop-ins are prepackaged sachet-style packets of dimensionally stable, chemically inert, aluminum silicate clay. The internal structure of this clay is a network of microscopic pores that attract and hold water through physical adsorption. Desi-Pak® remains dry and will not soften or liquefy even at full water saturation. It is non-corrosive and can be placed in direct contact with metal parts. The Activated Clay used in our Desi-Pak Drop-in Packets® actually adsorbs MORE water vapor than Silica Gel at low Relative Humidity. Desi-Pak® Activated Clay is non-synthetic, naturally-occuring material. It is the same Activated Clay desiccant used in our MIL-D-3463 compliant desiccant bags. Desi-Pak® GDT II Drop-ins are a cost efficient desiccant that will protect the contents of a sealed container until it is opened. The contents of a sealed container will remain free from mildew or corrosion and will be in the same condition as when packaged for shipment or storage.